south Korean steel giant posco continues to face stiff public resistance in Orissa's Jagatsinghpur district where the company is setting up a 12 million tonne steel plant. On April 1, protesters violated the district administration's prohibition orders and entered the Balitutha bridge near the plant site. "This is our land and no one can stop us from holding a meeting here," said Manorama who led a team of women from Dhinkia village. Police detained several agitators who were led by Abhay Sahu of the posco Pratirodh Sangram Samiti. The protesters included those who were evacuated from the area in November 2007 for the project. Apart from those who lost land for the proposed plant site in eight villages in three panchayats, people from far-lying Kalinga Nagar and Ganjam districts also joined the agitation. 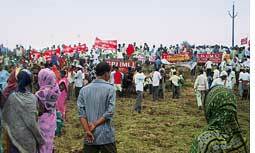 Tension has been mounting in the area for the past few months after many protested against land acquisitions (see: 'Posco war', Down To Earth, December 31, 2007). Though the company had said it would hold a "ground-breaking" ceremony on April 1, it postponed the event. Addressing a meeting of the agitators later, Sahu hailed the "capturing" of the bridge as symbolic victory of the people over the company. Several political leaders from neighbouring areas attended the rally. "The government is trying to impose its will on the people," said Shambhu Nath Nayak, mla from Jashipur, Mayurbhanj district. Authorities recently conducted a socio-economic survey of Gadkujang, Nuagaon and Dhinkia panchayats last month, but they faced stiff resistance against acquisition of land. The proposed plant is coming up on 1,620 hectares (ha) that includes 1,254 ha of forest. Recently, attempts by the authorities to acquire some sand dunes on the banks of the Jatadhari river also met with protests. Though the government recently signed an agreement with the company, the project has made little headway. posco spokesperson, Shashank Patnaik, said the delay in commissioning the project is due to "the time taken in obtaining certain procedural sanctions". He, however, did not elaborate on the sanctions. Sources in the government said the sanctions might be related to the mining lease and the compensatory afforestation that the company would have to undertake for the forest its project would destroy. On March 28, the supreme court asked posco to approach the Orissa government for allotting the demarcated mining area for the plant.